An easy and mouthwatering Prawns/Shrimp shallow fry which you can prepare in 30 minutes. This Chemmeen/Konchu fry is great as an appetizer, and also goes as a side-dish with rice. The best part is, you need just five ingredients! 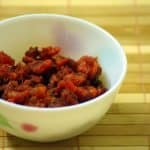 The recipe inspired by our uncle’s prawns fry preparation for our family get-together. Marinate cleaned prawns with the ingredients listed under marination. Keep it aside for 30 minutes. I used peeled and deveined shrimp. Fry prawns - Heat oil in a flat and wide pan. I prefer coconut oil for frying. This is a shallow fry preparation, and a flat pan works the best. At medium-high flame, add prawns to the pan. Shallow fry the prawns for around 5-7 minutes on each side or until golden-brownish. Keep it aside. Fry prawns in batches. Don't overcrowd the pan. Fry coconut - You can use the same pan to fry coconut. Leave 1 tbsp oil in the pan. Remove the excess oil. At medium flame, add grated coconut and curry leaves. Sprinkle salt. Fry it until golden. You can also prepare it with the tiger prawns. With tiger prawns, marinate the prawns as per the recipe, insert a toothpick through the prawns and then fry. Inserting toothpick, helps to get the prawns fried properly.